Click here for the last version of the programme of the conference (last updated: September 22, 2010). 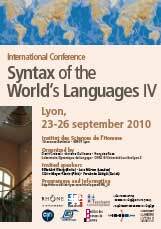 Click here for the book of abstracts of the conference (last updated: September 16, 2010). Note that printed versions of the book of abstracts will not be delivered at the conference. Click on the pins for more details.